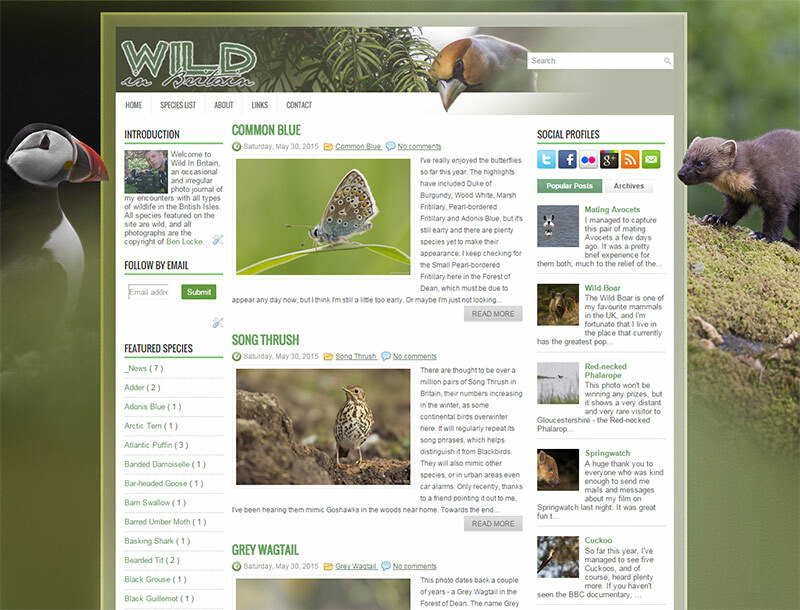 It doesn't seem that long ago that I gave WildInBritain.com a new lick of paint, but it was just over a year ago, in April 2014. For someone who enjoys fiddling with websites more than would normally be deemed normal, I've shown restraint in leaving it alone since then, especially considering how generally slow and unresponsive it was. Hopefully the new look and layout that I've just finished working on will prove snappier and more intuitive than before. It may still get the odd tweak, but I think it's as good as finished. Until next time anyway. The next thing on my list of unnecessary fiddling is to enhance the species database. The species list was only ever really intended for my own benefit and reference, but putting it online makes it convenient for me to access (almost) anywhere. However, with the list constantly growing, I'm finding that it would be useful for me to refine the filtering so that I can narrow down the results beyond simply the class of species, so that's the next thing I'll be updating.